I reluctantly agreed and mother's magic worked...we ended u making a huge batch, it tasted better than the first and second..
Before you kill me for not capturing the step by step pictures let me tell you that you will find it on the internet or youtube easily. Here you will get a lot of confidence so read the steps as carefully as you can..
1) In a heavy bottomed pan, heat ghee. 2) Mix the 2 flours together and add to the hot ghee. Keep stirring constantly till it is well cooked - about 8-10 min. 3) When the flours are cooked, set the pan aside. Do not cool it down much. The mixture would be semi liquid at this stage. 4) In a large non stick pan, add the sugar along with 1.5 cups of water. Let the mixture come to simmer. Reduce flame and keep watching. Ensure that you do not stir until this point at all. Also to stir always use only wooden spoon. 6) Switch off the gas and add the liquid glucose or vinegar and stir quickly. 7) Now pour the sugar syrup on the non stick pan (preferably greased with ghee). 8) After a minute or two as it starts cooling a stretchy tar like mass will start forming. Using a fork and spoon, start pulling it outwards from the centre. 9) Drop it back to form a ring and keep repeating the action until the sugar becomes hard and difficult to stretch. 10) At this stage, start adding the flour mixture (which should be warm if not hot). The sugar will start become malleable again. Continue the stretching activity alternating with adding the flour mixture. 11) The stretching will create sugar threads. Continue doing as much as you can. 12) When the mixture starts cooling down, place it on the greased plate. 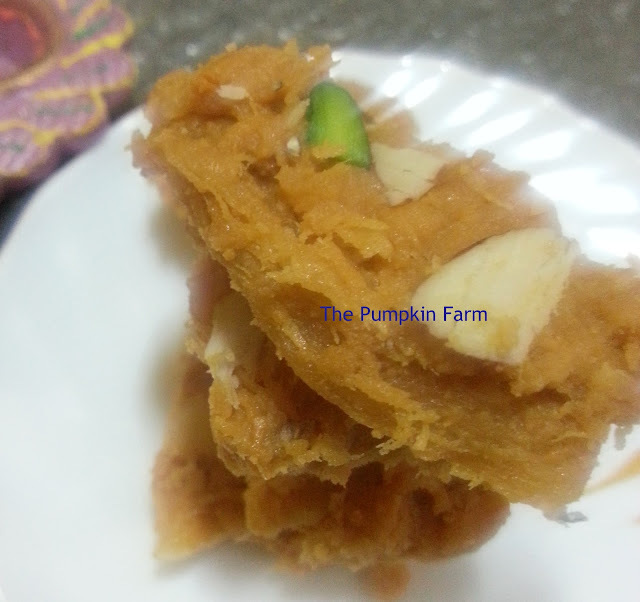 13) Sprinkle chopped nuts on the top and using a rolling pin roll it out flat. 14) Cover and let it stand for a couple of hours. 15) Cut in small pieces and transfer in large batches. Ideally try to store in the same plate. Am so proud of your guts Pradnya. Am so inspired to try it next time there.s a special occasion. Wonderfully done. And let me know how many days it lasts at room temperature. Did i mention they look awesome??? Absolutely wonderful and will defly try it sometime.. first a small batch using your tips. It definitely takes a lot of guts to try a recipe that has not worked once...gr8 going..will give this a try. 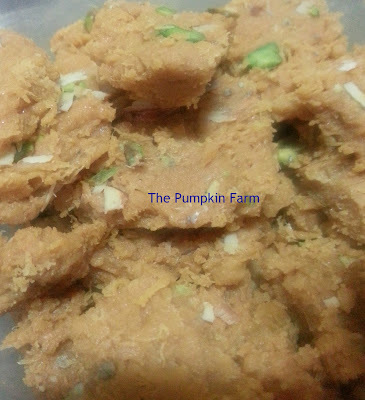 I never knew soan papdi can be made at home. Definitely a labor intensive process, but I'm sure every minute might have been worth it with the delicious homemade soan papdi. Wow Soan Papdi at home!!! amazing and delicious!!! I too bookmarked this one from Gayathri's space. But am still hesitant to try out no ,more so now that you mentioned its not for the weak hearted and weak armed!